In our present "No user serviceable parts inside" world of electronic products, it is easy to understand why very few people have an appreciation for the technical prowess needed to troubleshoot and repair them. 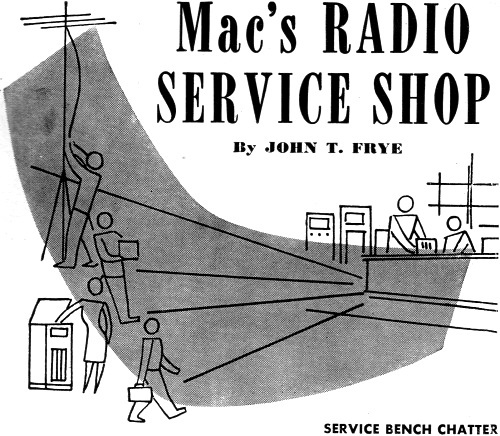 When reading through these episodes of "Mac's Radio Service Shop" that appeared in mid last century editions of Radio & Television News magazine, I am inspired to envy the skills that small electronics repair shop owners had for working on the old vacuum tube based radio and television sets. Digital electronics has its own unique set of quirks and special knowledge requirements to troubleshoot, but when everything is analog rather than merely being required to be a '0' or a '1,' tracking down problems in an efficient manner requires an acquired combination of experience, theory, and luck - where the luck portion is actually largely a factor of experience and theory. When I drive past a long ago shut down service shop with a faded sign offering repair of Sylvania and GE television, I wax nostalgic over an era of electronics that I missed by only a couple decades. A loud slam of the shop screen door announced' that Barney was back from the service call he had started on only a few minutes before. "Mission accomplished!" he said, making a sign of smug self-approval with circling thumb and forefinger. "It was the old story: they had moved the TV set across the room and, as a result, had more lead-in than they needed. Someone had told them that twin-lead could not be spliced; so, since they thought they might sometime want to return the set to its original position, they rolled the extra twin-line into a neat little coil and poked it into the back of the set. As you can guess, Channel 4 was very blizzardy, and 6, 7, and 9 could not be seen at all. "As soon as I whacked off the extra lead-in, everything was hokey-dokey. I sold the man one of these little plastic twin-line splicers and showed him how he could use it to restore the chunk of line we had amputated if he ever wanted to move the set back to where it was. Then I checked the ion trap to make sure it had not been jarred out of adjustment when the set was moved. Sure enough, it was off quite a little; so I put it back where it belonged and at the same time touched up the focus. The guy was most happy to learn that nothing serious was wrong with his set, and he paid the service charge without a whimper, even though I had only been in the house about ten minutes." "Good boy!" Mac applauded, "I especially like the fact that you checked that ion trap. Often when a technician locates a simple trouble, it seems to the customer that he is being charged an awful lot just to be told that his set was not plugged into the wall socket, and so forth. What he can't always understand is that if the technician had not been called away from his bench, he could have made that five dollar service charge and more without stepping outside the shop. In such a case, the service charge is really not for what the technician does at the customer's home; instead, it is to compensate him for the income he lost by being called away from his bench. "However, an alert technician can invariably make some little adjustment on a set, such as touching up the linearity or centering controls, that will produce an easily-seen improvement in reception. This minor service usually takes only a few seconds to accomplish, and it leaves the customer with the happy feeling that he has received a good return for his money. In this case, he really did, too. If that ion trap had been left out of adjustment, it could easily have ruined the picture tube in a short time." "Oh yeah," Barney interrupted, "there's one other thing. After the set was turned off, the tube continued to emit flashes of light like heat lightning every few seconds all the time I was there. The man said it would continue to do this at a decreasing frequency rate for as long as two hours after the set had been shut off and even the plug pulled from the wall socket. I promised to ask you about it." "That's a timely one!" Mac exclaimed with a chuckle. "Just last week I wrote a letter to the engineering department of a large kinescope manufacturing concern and asked about the same thing, for I had noticed it happening on a set we had in here for service. The engineers wrote back that quite often a tube will have what they call 'cold emission' and continue to emit electrons sporadically for some time after all heat has left the cathode. The filter condensers on the high voltage circuit retain a charge for a long time and maintain a potential on the tube electrodes after the power has been cut off. This potential directs the bursts of electrons to the screen and causes it to flash. The engineers said they did not know how to prevent it and did not think anyone else did either. However, they left the impression that it was nothing to worry about, outside of the rather spooky feeling it gives you to see a 'dead' set carrying on in that fashion." "I had to do a little service on my own set last night," Barney said as he placed an a.c.-d.c. set on the bench and started removing a defective filter condenser. "Right in the middle of the wrestling matches, the whole screen went dark except for a streak right up and down the middle of the screen about a quarter of an inch wide. I was feeling mighty low when I saw that, for I figured something must be wrong with the horizontal portion of the deflection yoke. I reasoned that if anything was wrong with any other part of the horizontal deflection circuit, there would be no high voltage, for the set uses a horizontal flyback type of high voltage circuit; and that would mean there would be no illumination of the screen at all. "However, with the same dopey impulse that makes a man who does not know from nothing about automobiles get out and lift the hood and peer beneath it when his car won't start, I pulled the set out from the wall and looked into the back of it. The first thing I saw was a tiny but very bright little spark on top of the 6BQ6G horizontal output tube inside the high-voltage cage. Right away I shut off the set and poked the tip of my solder gun through the louvers of the cage and reheated the solder on that plate cap; then I turned the set back on, and it took right off and played all right all the rest of the evening." "That was a queer one," Mac mused. "Apparently the expansion and contraction of the tube broke the solder connection between the cap and the plate lead, but the separation was so tiny that the current arced across it; and, while this current was too low to sustain any appreciable amount of deflection, it was sufficient to produce enough voltage to illuminate that narrow streak on the screen." For a little while there was silence in the shop as each of the men became engrossed in his work. Mac was installing a new quadrature coil in a gated-beam TV sound detector, and Barney was installing new filter condensers in the small set. Barney was through first, and after he had cleaned both cabinet and chassis and put the two together, he placed the receiver on the secondary bench and snapped it on for the thirty-minute check that Mac insisted each set must pass before leaving the shop. For several seconds there was no sound at all, and then the set snapped on with a burst of music. Barney turned the volume down and picked up another set from the to-be-worked-on group. "You satisfied with that set?" Mac asked without looking up. "I know from your tone that I'm supposed to say No," Barney replied; "but I don't seem to see much wrong with it. It's a little slow warming up is all." "How about that popping on so abruptly?" 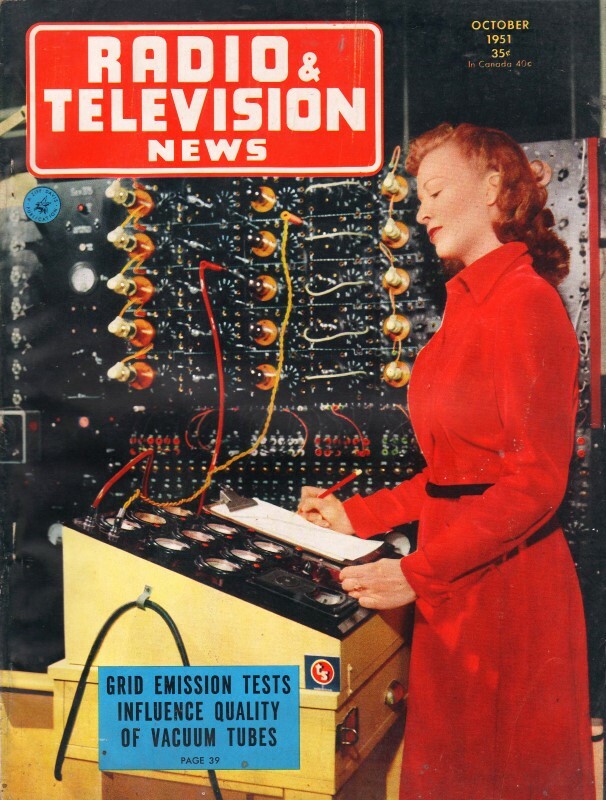 "Probably an oscillator tube cathode that comes up to operating temperature a little after the others," Barney suggested. Mac shook his head. "I don't think so. The sound came on too abruptly. Seemed as though something had the audio completely choked off until the set reached a certain temperature." He picked up a little rubber hammer such as doctors use for testing reflexes and walked over to the set. Removing the back, he tapped the 12SQ7 first on one side and then on the other. Suddenly the set stopped playing as abruptly as it began, but another rap on the duo-diode-high-mu triode started it once more. "The grid is probably shorting to the cathode," Mac explained as he tossed the tube into the discard box and put in a new one. "In these high-gain triodes the spacing is very close, and quite often a short will occur at one particular temperature. This tube was shorted until it got just so hot, and then the short disappeared; but the slightest jar was all that was needed to make it short again. "Never let one of these sets that come on with a bang go out of the shop," he concluded. "Even if it is a slow-starting oscillator, find out why it is sluggish and correct it, for the oscillator that starts slowly this week probably won't start at all next." ""Okay," Barney said with a shrug of resignation, "but if you keep on giving me symptoms of coming trouble for me to keep in mind and correct before letting the set go, I'll be getting out about two sets a day." A quick frown went across Mac's face. "I'd rather have you put out one set a day and do it right than put out a dozen cobbled-up jobs that will probably bounce or lose customers or do both," he said sharply. "Eventually I want you to learn to turn out good work fast; but if you will just keep on concentrating on doing your best on every set, the speed will come automatically." "Now don't get your Scotch up," Barney said soothingly. "I was just popping off without thinking. I know you are doing your best to make a really good technician out of me, and I want you to keep right on doing it. For example, what do you suggest about this job here. The lady says that this set has a very annoying whistle in it at times, but I've had it playing for three hours without hearing any whistle." He turned on the little three-way portable, and instantly it emitted a little pinging sound and then started to play perfectly normal. "Put it on the isolation transformer and run the line voltage down a little," Mac suggested. Barney obeyed, and at one setting of the line voltage the set started to howl with the characteristic musical-saw sound of a microphonic tube. "There's your whistle,''' Mac told him. "As you should know by now, you can't place too much importance in the words a customer selects to describe the way a set sounds. We'd call that a howl, but to her it is a whistle. It only happens when the microphonic tube - and you can find which one that is by tapping them - is at a certain critical temperature. That is why it emitted that little pinging sound as it passed through that critical temperature during the brief warm-up. When we backed the line voltage down until the filament temperature was again at that point, the microphonic condition was sustained. At her home, probably the line voltage often stayed close to this critical voltage-figure for some periods of time, and then her set kept right on whistling - I mean howling!"